Born in 1978 in France, lives and works in Paris, France. L'Atlas begins to paint in the streets in the early 90's. 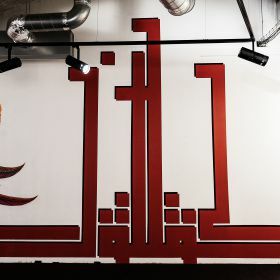 He is passionate about calligraphy that he studied in middle-east and rapidly creates his own writing. Symmetry and straight characteristic of his lines push him towards a reflexion on geometric abstraction close to the optical art.